It's not the first time Foster was arrested this year. The Washington Redskins claimed the rights to linebacker Reuben Foster two days after the San Francisco 49ers dropped him from their roster over alleged domestic violence against his girlfriend last weekend. “The Redskins fully understand the severity of the recent allegations made against Reuben. If true, you can be sure these allegations are nothing our organization would ever condone,” Doug Williams, senior vice president of player personnel, said in a statement posted to Twitter. Foster was arrested on Saturday, Nov. 24 at the Grand Hyatt hotel in Tampa, Florida, after his girlfriend called 911. He was charged with first-degree misdemeanor domestic violence, according to a criminal report from the Tampa Police Department. Foster’s girlfriend told police that following a verbal altercation, he slapped her phone out of her hand, pushed her in the chest and then slapped her on the left side of her face, according to the police report. It also noted that there was a 1-inch scratch on her left collarbone. “Let me be clear, Reuben will have to go through numerous steps including the full legal process, an investigation and potential discipline from the NFL, as well as meetings with counselors associated with the team before he will ever have the opportunity to wear the burgundy and gold as a player,” Williams said in the statement. During a press conference on Wednesday, Redskins Coach Jay Gruden defended the team's decision to claim Foster before an investigation wrapped up, saying, "We probably could have done that, but we saw an opportunity to claim him and we chose to do that as an organization." "There's no guarantee he is ever going to play here," he added. "He's got a lot of work to do personally, with the team, with the NFL, with himself before he even thinks about playing football again." 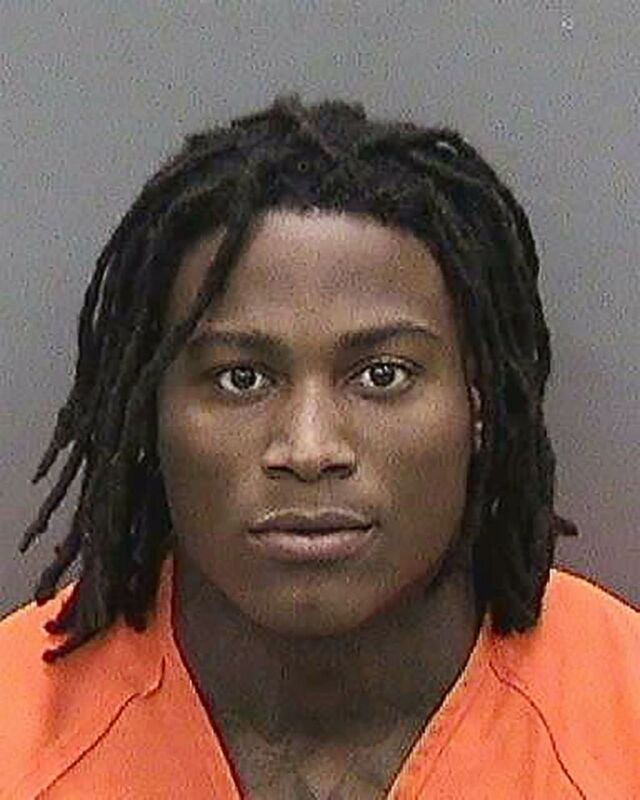 (Hillsborough County Sheriff's Office via AP) San Francisco 49ers football player Reuben Foster is pictured in this Nov. 24, 2018, photo provided by the Hillsborough County Sheriff's Office. Foster has been placed on the NFL’s Reserve/Commissioner Exempt List for the duration of the NFL’s investigation into his arrest. A player who is on the list is not allowed to practice or attend games, “but with the club’s permission, he may be present at the club’s facility on a reasonable basis for meetings, individual workouts, therapy and rehabilitation and other permitted non-football activities,” according to the 2016 personal conduct policy for NFL players, published on the NFL’s website. A first-round pick for the 49ers in 2017, Foster has faced multiple run-ins with the law over the past year. In January, he was charged in Alabama for second-degree marijuana possession — a charge that was later dismissed, ESPN reported. In April, he was charged again with felonies for domestic violence, criminal threats and weapons possession, accused of abusing his girlfriend, ESPN reported. His girlfriend later recanted the allegations and a judge ruled there was no probable cause on the first two charges, while the weapons charge was downgraded to a misdemeanor. Foster pleaded no contest to that in June, ESPN reported. Though it’s unclear if the incidents earlier in 2018 involved the same woman, the criminal report from the Tampa Police Department said that Foster had been in an on-and-off relationship with his girlfriend for three years and that they had lived together in the past.